What does labor smell like? Labor is a dynamic, self-regulating art installation that re-creates the scent of people exerting themselves under stressful conditions. There are, however, no people involved in making the smell – it is created by bacteria propagating in the three glass bioreactors. Each bioreactor incubates a unique species of human skin bacteria responsible for the primary scent of sweating bodies: Staphylococcus epidermidis, Corynebacterium xerosis and Propionibacterium avidum. As these bacteria metabolize simple sugars and fats, they create the distinct smells associated with human exertion, stress and anxiety. Their scents combine in the central chamber with which a sweatshop icon, the white t-shirt, is infused as the scents are disseminated. The scent intensifies throughout the exhibition. 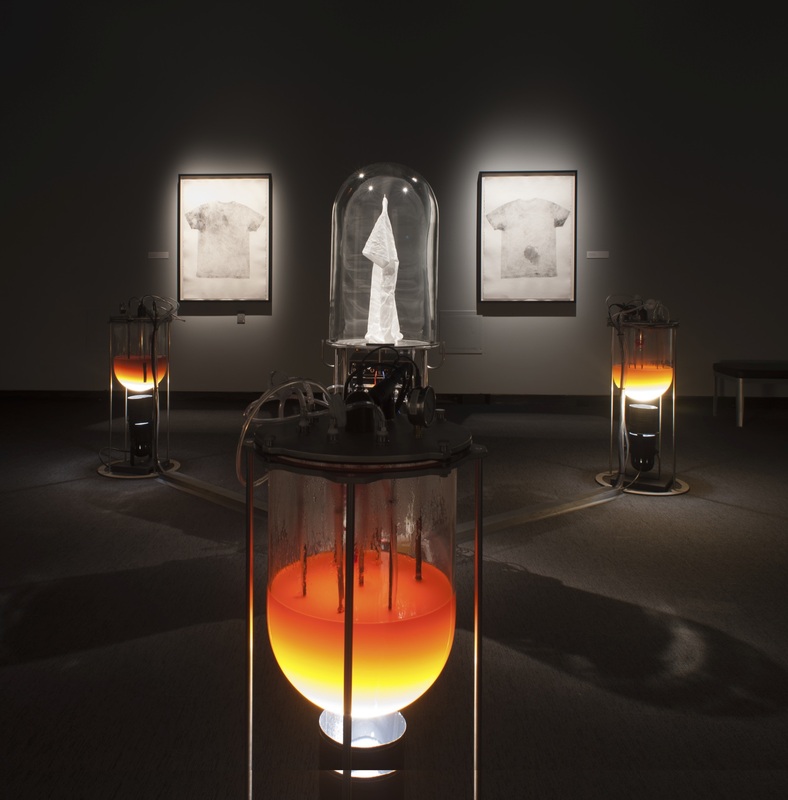 The Labor project reflects upon industrial society’s shift from human and machine labor to increasingly pervasive forms of microbial manufacturing. Today, microbes produce a wide range of products, including enzymes, foods, beverages, feedstocks, fuels and pharmaceuticals. They literally live to work. These new industrial activities point to a deepening of the exploitation of life and living processes: the design, engineering, management and commodification of life itself. In Labor, the microorganisms ironically produce the scent of sweat, not as a vulgar bi-product of production, like in factories of the 19th and 20th centuries, but as a nostalgic end-product. opposite: Labor, Burchfield Penny Art Center. photo by Tullis Johnson. The sweat-stain-transfer imprints are a novel analog documentation method. 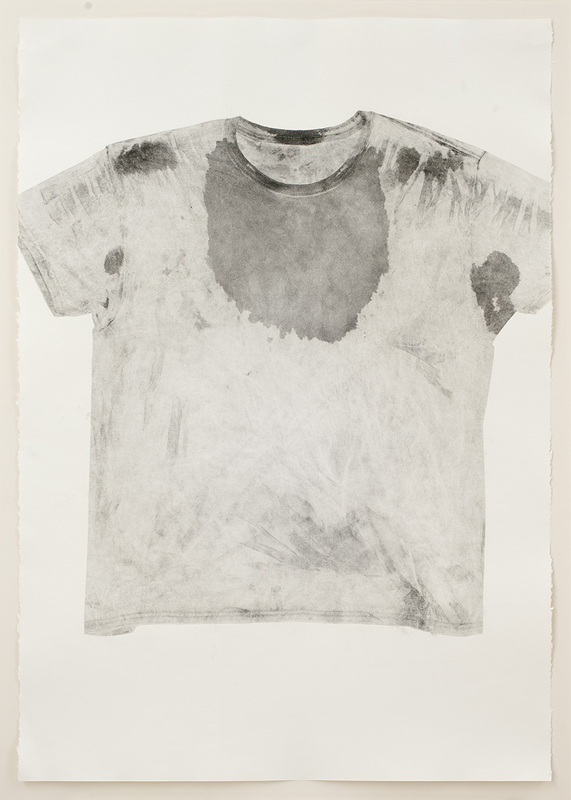 Moist, freshly soiled shirts are dusted with charcoal and sandwiched between paper at high pressures, which impregnates the paper surface with their image. 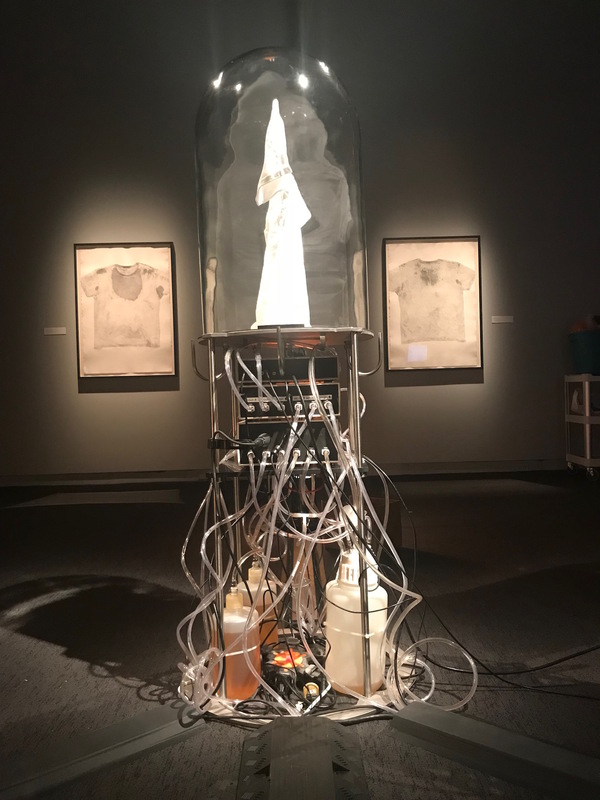 In the Buffalo exhibition, each pair of prints chronicle a single t-shirt that was worn by a university student paid at the prevailing wage. The images are full-scale, two-dimensional records of a richly visual termporal moment and unconscious performative action. Both front and back stains of each t-shirt are rendered. This method was first demonstrated at Cultivamos Cultura in São Luis, Portugal in the summer of 2017. After heavy laboring, I collected our sweaty shirts, dusted them, sandwiched them between paper and boards, and ran them over with an SUV. This produces embossed evidence of labor, portraits not of people nor of shirts but patterns of intimate excretion. Subsequent imprints were demonstrated in the Labor performance at Applied Microperformativity symposium in Vienna, Austria in 2018.
opposite: Martin, Front: seat-stain-transfer print, 2018. Labor also reflects upon our changing understanding of what we are. Microbes in and on the human body vastly outnumber human cells and they help regulate many of our bodily processes, from digestive and immune systems to emotional and physiological responses like sweating. Our microbiota is integral to who and what we are, and complicates any simplistic sense of self. Likewise, the smell of the perspiring body is not just a human scent, unless we are willing to redefine what we mean by human. opposite: Bioreactor from Labor. Burchfield Penny Art Center. photo by Tullis Johnson. Three bacterial strains have been identified as keys to the production of human scent, from the genera Staphylococcus, Propionibacterium and Corynebacterium. Staphylococcus species metabolize skin secretions into compounds such as isovaleric acid, to produce a fairly mild scent and are associated with the eccrine sweat glands, which excrete primarily salts and water to regulate body temperature. Humans’ ability to distinguish this “high-pitched” scent has been found to vary by as much as one hundred-fold between individuals. Propionibacterium species metabolize more complex excretions from the apocrine glands and are responsible for vinegary, acrid odors, particularly under anaerobic conditions. Corynebacterium break down the lipids in sweat to create smaller volatile molecules like butyric acid. However, all these microbes act in complex, communalistic ways on the human body and utilize varied metabolic pathways to produce an aromatic bouquet of a complexity far greater than the sum of their parts. 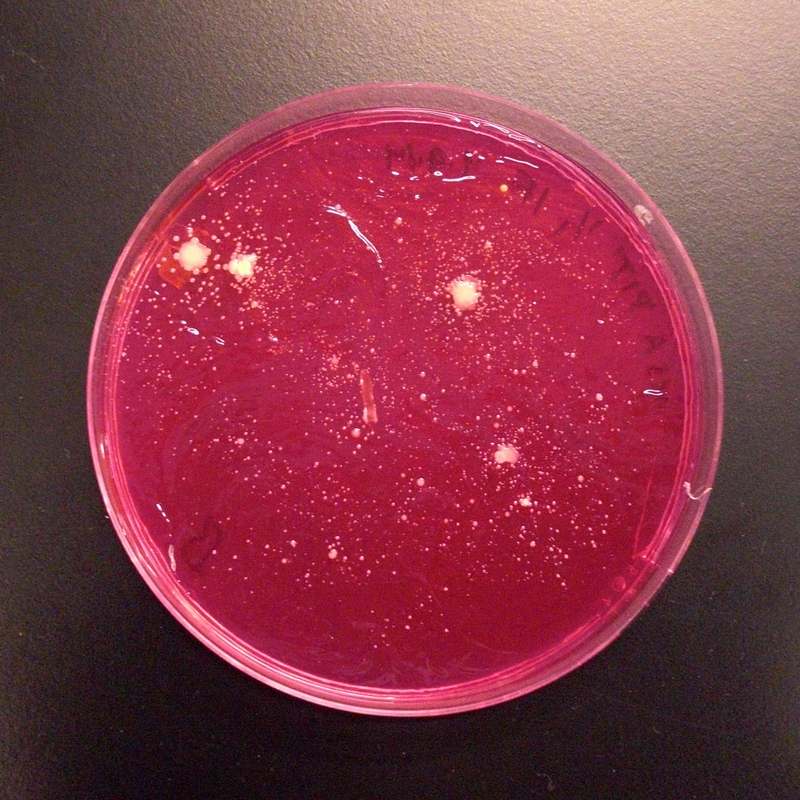 opposite: Petri dishes containnig first experimental isolation of Staph epidermidis from Vanouse's armpit on MSA medium, Biofilia, Aalto Univesity Helsinki, 2014. Cultivating skin bacteria in vitro is difficult as these strains best survive in the complex ecosystem of the human skin. 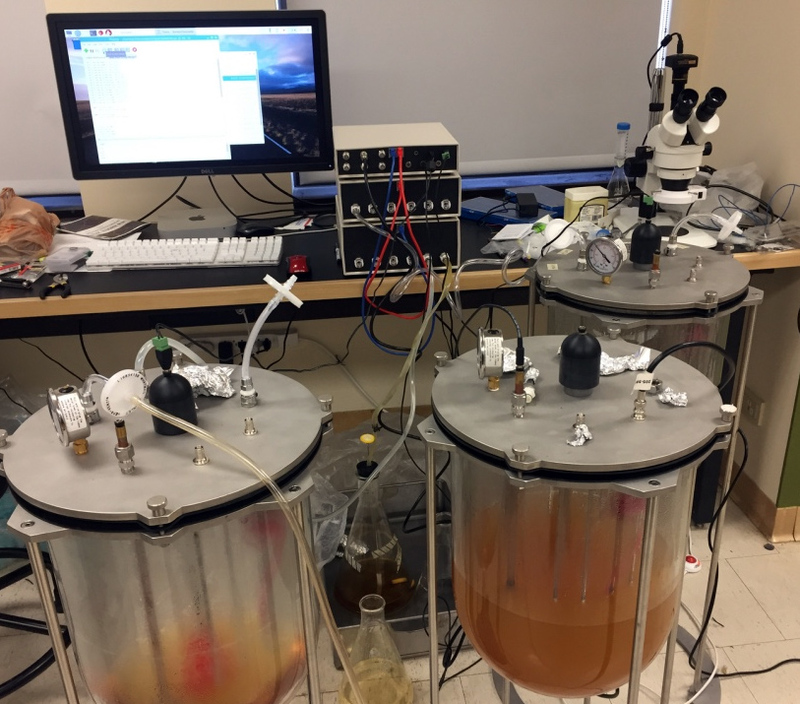 At the Coalesce lab, University of Buffalo, I’ve built custom incubation equipment to investigate at which metabolic stages, and under which conditions these organisms are most fragrant. I have not engineered genes into microbial production strains (as a synthetic biology approach would entail), but rather adjusted incubation conditions to fit the organisms and maximize their particular scents. The three custom bioreactors are monitored by a Raspberry Pi-based automation system that incorporates stirrers, biosensors, pumps, heaters and valves to automate these conditions for continuous production. 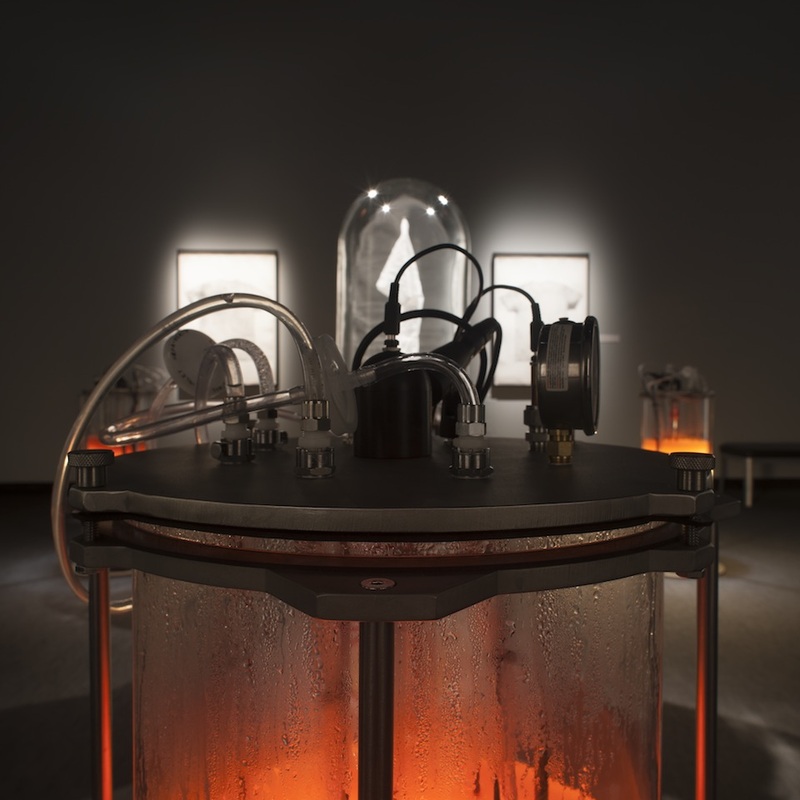 Visitors to the installation are immersed in both the scent of the microbes as well as the sounds of these processes, such as nutrients and pressurized gasses flowing through the automation system and into the bioreactors. opposite: Developing Labor. Coalesce Center for Biological Art. Solon Morse, University at Buffalo. Jerry Koudelka, University at Buffalo. Tom Gruenauer, University at Buffalo. Don Metz, Scott Propeack, Tullis Johnson, Jennifer Surtees, Shanna Snider and Jeff Sherven without whom this exhibition would not have been possible. Eileen Sylves, Kristie Reilly, Kevin Cullinan, Gary Nottingham, Domenic Licata, Sara Thomas, Dave, Pawlowski, Mizin Shin, Alyssa Crane, Leonardo Aranda Brito, Darya Warner, Robert Jones, John Santomieri, Martin Chittum, Fern Johansson, Goldie Segol, Orry Segol, University at Buffalo. Marta De Menezes, Cultivamos Cultura, Portugal. Ulla Taipale, Pia Lindman, Marika Hellman, Aalto University, Finland. Jens Hauser, University of Copenhagen, Denmark. Burchfield Penny Art Gallery, Buffalo State College. Coalesce Center for Biological Art, University at Buffalo. Genome Environment and Microbiome Community of Excellence, University at Buffalo. Humanities Institute, University at Buffalo. CAS Machine Shop, University at Buffalo. Print Media Lab, Department of Art, University at Buffalo. Angewandte Innovation Lab, University of Applied Arts, Vienna, Austria. Biofilia: Base for Biological Arts, Aalto University, Helsinki, Finland. HIAP Artist in Residence program, Helsinki, Finland. Cultivamos Cultura Artist in Residence program, São Luis, Portugal. Joan Linder, Rafael Vanouse and Lucien Vanouse.